Stone Age Gamer was founded in 2007 and for the first few years was actually ran out of the owners' apartment. At its beginning it was one steel shelf and the owner's game humble collection. Over the next few years, business growth was steady but slow. The business moved with its owners out of the apartment into a house, eventually occupying two bedrooms and a good portion of the basement. The business's initial focus was retail—selling new console clones and used games and hardware. However, its owners knew that dozens, if not hundreds, of other sites sold these same products. In order to survive and thrive, the business needed unique and exclusive products to set apart Stone Age Gamer in the retro video game market. That opportunity came along with the rise in popularity of flash carts. Starting in 2010, Stone Age Gamer teamed up with flash cart producer KRIKzz to offer Cart Only and Deluxe versions of flash carts, because at the time KRIKzz was only offering the boards for sale. Stone Age Gamer set itself apart in the crowded flash cart market by offering customized, professionally-manufactured flash cart bundled with manuals, memory cards and more. As the offering of flash carts for different systems expanded, Stone Age Gamer continues to maintain high quality that its customers deserve and expect. In order to achieve this goal, an expansion was inevitable and necessary. The business's flash carts were originally manufactured out of the owner's home basement. In order to keep up with growing demand, the business rented and began the transition into a commercial retail and manufacturing location. The transition was completed in late 2013. The majority of business operations, including all shipping and manufacturing, now emanates out of Salem, Ohio, U.S.A.
Stone Age Gamer continues to add exclusive new products and to expand into new territories. In 2013, it began manufacturing and selling the "BitBox", a game case for the Nintendo Entertainment System. Stone Age Gamer has also expanded its physical presence in the retro video game community by attending classic video game shows in Cleveland, Pittsburg and Philadelphia. Recently, the business hosted a fun-filled TecmoBowl tournament. This also marked the first time the "brick-and-mortar" location was opened to the public. 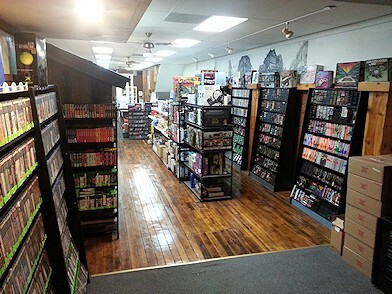 As of November 2015 the Stone Age Gamer location in Salem, Ohio is now open to the public. Please check out our contact us page for up to date store hours.